When we start practicing spiritual life, we may resolve to give up sensual indulgence. But as our material attachments are deep-rooted, they frequently overpower us. On floundering thus, we may become frustrated and give up our spiritual practices. How can we deal with such frustration? By contemplating that spiritual growth rests not as much on self-mastery as on connection with Krishna. And staying connected with him requires humility, acknowledging our dependence on his grace. In contrast, our ego makes us feel that we are controllers and enjoyers, with no need for him. Usually, when we are in materialistic consciousness, the ego wants us to be the enjoyer of worldly objects. When we start orienting ourselves spiritually, this ego doesn’t easily let go – it attacks in a different garb, wanting us to be the enjoyer of our renunciation. Desiring to look down at those still enjoying sense objects, it wants instant detachment: “After I decide to renounce sense indulgence, I shouldn’t feel any temptation. If a temptation somehow comes, I should immediately feel averse to it.” Whereas earlier it wanted enjoyment by summoning sense objects at will, now it wants enjoyment by rejecting sense objects at will. Either way, it keeps us obsessed with ourselves and distracted from Krishna. While we are thus controlled by the ego, whatever frustration we feel on failing in sense-control is largely ego-induced. To avoid such frustration, we need to be humbly patient and perseverant. 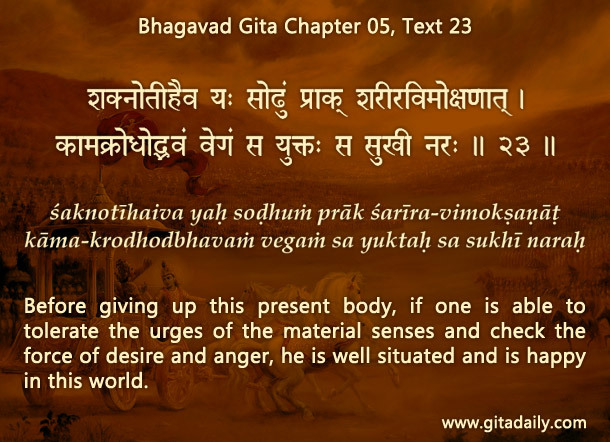 The Bhagavad-gita (05.23) assures that those who tolerate lifelong the forces of desire and anger – the twin machinations of the ego – gradually become spiritually connected and fulfilled. When we resist the ego’s temptation to expect immediate resistance to temptation and focus instead on humbly seeking Krishna’s shelter, even in the presence of temptation, we progress authentically towards pure fulfilling absorption in him. Hare Krishna! A Very subtle point about how ego makes us want to enjoy our renunciation. Thank you. Wonderful analysis…and a very practical solution… Thank you very much.